The volume model is the base of all volume rendering. This is where the data comes from being transformed later into triangles. With this kind of modelling, constructive solid geometry (CSG) becomes easy as only the function f(x, y, z) needs to be modified [SW04, S. 1]. c is also called the isovalue. The surface of the function at c is called isosurface [NY06, S. 1]. Typically, a isovalue of 0 is chosen. This way, negative densities are outside of the model and positive ones within. White is the highest possible density r, marked with a red dot. 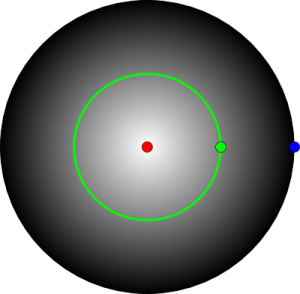 At the green dot is the isovalue equal to 0, a mid gray in the image. 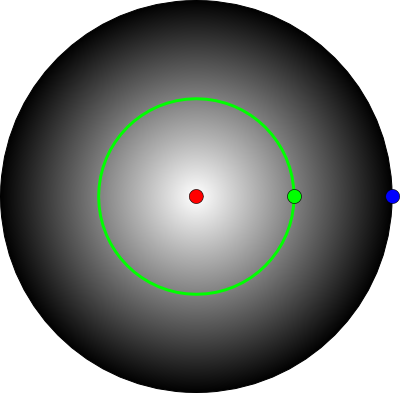 All positions with an isovalue of 0 are marked in green and so a circle is created. The mapping of this isosurface with a mesh is called contouring [Hom10, S. 6]. Finally, the density function at the blue dot equals to -r.